In 2011, Dutch artist Levi van Veluw built three versions of his boyhood bedroom, covered with thousands of symmetrical wooden shapes to symbolise his ‘urge for order and fear of losing control’. He has since developed that theme of the world on the edge of order or just tipping over it through charcoal drawings, installations, photography and film. Archive is part of his major project The Collapse of Cohesion. 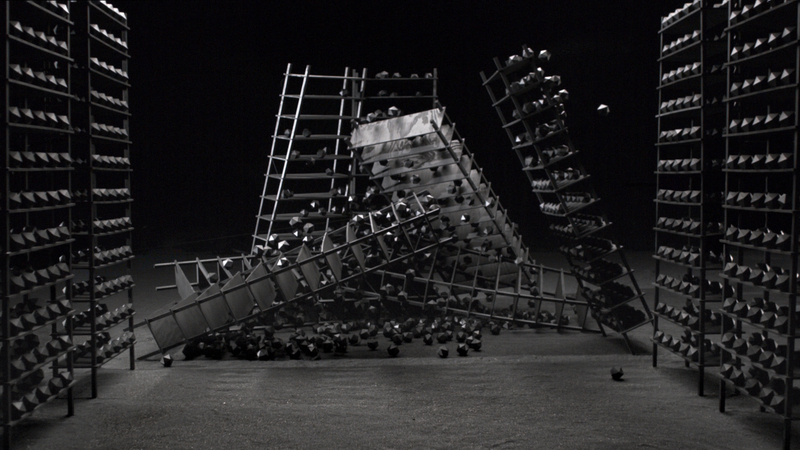 It shows cabinets laden with geometric forms crashing down in slow motion: not only might that stand in for the failure of aattemtps to impose order on the world, hence for emotional trauma, the molecular references could easily link it to the ‘Big Crunch’ which will be the ultimate end of times. And yet the fabulous aesthetic offsets that sufficiently to leave us in an ambiguous space.